Basketball and multi-purpose courts are found everywhere from parks and schools to clubs and homes. SportMaster systems are ideal for any indoor or outdoor court surface in any part of the world. Netball, Volleyball, and a variety of activities can be played on an acrylic game court surface. Why use a SportMaster Surfacing System on your outdoor basketball court or recreational area? Court Protection & Maintenance: SportMaster repair and coating products protect and extend the useful life of the asphalt or concrete surface from the sun, weather and environmental contaminants. Aesthetics: 16 standard, vibrant colors ensure many years of fade-resistant beauty for your investment. Safety & Texture: SportMaster acrylic surfaces are shipped with or without sand. A non-skid surface can be achieved to prevent slippery conditions on a dry or wet sport surface. Support: SportMaster Sport Surfaces are stocked and supported throughout the United States and around the world at more than 90 SealMaster locations. 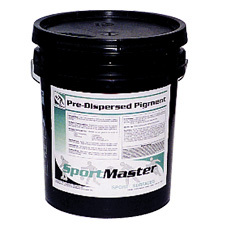 All SportMaster systems can be applied on properly constructed asphalt, concrete, or existing acrylic surfaces. SportMaster has many surfacing options from high-end, professional facilities to a backyard court. If you are interested in getting cost estimates for basketball court construction or resurfacing, contact us for referrals to qualified sport surfacing contractors in your area. The SportMaster® ColorPlus™ System is Revolutionizing the Tennis Court Surfacing Industry. Ease of Mixing: ColorPlus™ is a highly concentrated pigment dispersion that disperses readily in Neutral Concentrate™. Our proprietary technology enables ColorPlus™ to disperse completely with minimal mixing. Exceptional Quality: The ultra-fine particle size of the ColorPlus™ Pigment Dispersion produces vibrant, consistent color quality on the court surface. Greater Inventory Control: By stocking a single base product, contractors are able to optimize warehouse space and reduce shipping costs. The ColorPlus™ System takes much of the guesswork out of ordering color coatings. Contractors simply maintain a minimal level of ColorPlus™ Pigment in one gallon pails. Bulk Options: The ColorPlus system is also available in a unique bulk system that is perfect for minimizing drum usage and disposal. For more information on the ColorPlus Bulk System, watch the video or contact your SportMaster representative. The SkateMaster system provides a durable, harder surface. SkateMaster is a great choice for basketball, multi-purpose courts and recreational areas with increased levels of play or activity. The surface can be customized with different amounts and sizes of sand for the desired texture. SkateMaster is an ideal surface for Shuffleboard and sports where a smoother and more durable surface is required. Contact a SportMaster representative for assistance with customizing the surface to meet your needs. The ProCushion System, depicted in the illustration above, is the ultimate professional and residential cushioned surface for basketball and multi-purpose courts. This 100% acrylic coating system is designed to provide optimum resilience and spin responsive play. The shock absorbing layers of the ProCushion system provide unparalleled player comfort at an affordable cost. Flexible acrylic binders maximize the feel of the rubber granules for decades after application. Each layer in the systems serve a specific purpose, and contribute to the quality of the finished court. Multiple acrylic color coating layers form the firm, uniform and durable wearing surface. SportMaster Systems can be installed indoors or outdoors, on asphalt or concrete. SportMaster surfaces can be used for a variety of sports and applications. Contact us for assistance in matching up or customizing the right surface for your project. A premium 100% acrylic emulsion designed for maximum performance and weather resistance. Neutral SkateMaster™ can also be used as an acrylic resurfacer filler coat. Surface is a harder surface than our other color coatings, and can be used for high-traffic basketball court surfaces. A premium 100% acrylic emulsion designed for maximum performance and weather resistance. Neutral Concentrate™ can also be used as an acrylic resurfacer filler coat. Sand needs to be added on site, for non-slip basketball court surfaces. A premium 100% acrylic emulsion designed for maximum performance and weather resistance. Neutral Concentrate™ can also be used as an acrylic resurfacer filler coat. Product ships pre-mixed with sand added. A highly concentrated pigment dispersion designed to disperse readily and completely in Neutral Concentrate™. Available in 16 standard colors. Ideal for maintenance crews and do-it-yourselfers. The proper sand and water is already added. Simply stir, pour, and apply by soft rubber squeegee. Available in 9 standard colors. 100% acrylic emulsion coating designed for on-site mixing with silica sand and water. Ideal for color coating tennis courts, basketball courts, and other pavement surfaces. Available in 9 standard colors. Similar to our standard Concentrate but with sand already added. Color Concentrate with sand takes the guesswork out of choosing the right type of sand. Easy to use, just add water and apply by soft rubber squeegee. Available in 9 standard colors. A unique acrylic color formulation engineered to match the flexibility in the cushion layers of the CushionMaster system. These color coatings maintain their flexibility over time, to keep the cushioned feel on the basketball court surface. CushionMaster Neutral Base is designed to be mixed with ColorPlus Pigment Dispersion. Acrylic emulsion that provides resilience and establishes the base texture to impart the pace of the surface. Contains fine rubber particles and fills voids and levels the final cushion components. Acrylic emulsion that provides resilience and establishes the base texture to impart the pace of the surface. Contains coarse rubber particles and provides the initial thickness build on the basketball court surface. 100% Acrylic trowel grade crack filler. Fortified with sand for filling cracks up to 1 inch wide. Available in red, green, blue, or neutral. 100% Acrylic water based textured line paint highly pigmented for one coat coverage. Clear drying 100% acrylic top coat for tennis courts, basketball courts, and more. Extends th elife of surface coatings. Ready-to-use. 100% Acrylic emulsion primer designed to promote the adhesion of repair products and coatings. Apply by spray, roller, or brush. Ready-to-use. Formulated for tinting latex used in installation of latex and rubber layered running track systems.